Each forging is designed using an advanced 3D modeling software package and is qualified through a rigorous Finite Element Analysis entity. 3D modeling enables CP to check thicknesses and weights before manufacturing allowing CP to produce the strongest and lightest part for your application. CP has developed proprietary tooling, dedicated cutters and unconventional fixtures to ensure that each piston is produced to the highest quality. Our 5-axis machining techniques allow us to create any piston while our computerized electronic inspection equipment makes sure we manufacture parts to the tightest tolerances in the industry. Whether you are a professional racer or a weekend warrior, CP prides itself to giving you the best part possible for your applications. All pistons at CP are put through a demanding quality control system and precise computerized machining, ensuring that your piston is the best piston available. CP groove stands for Constant Pressure Groove. This groove works as a channel on the lower part of the top land that equalizes pressure to the back of the top ring groove. When used in combination with lateral gas ports, the CP groove helps keep gas ports clear of carbon build up. In addition, the CP groove prevents the top land from smudging into the top ring if the land rubs the cylinder bore. Depending on the forging and application, different cam and barrel profiles are utilized for maximum performance. Each new design is thoroughly researched and modeled on sophisticated 3 dimensional software to ensure maximum strength and weight savings. The model is then transferred to an advanced Finite Element Analysis program to optimize design parameters for maximum strength and durability. A rapid prototype is then created to finalize design. Advanced machining techniques enable CP to virtually create any shape on a piston. Strict quality control allows us to hold the closest tolerances in the industry. Among the many unique technological advances CP Pistons uses to ensure a performance edge, Maximum Internal Lightening (MIL) has quickly become one of the most effective. Although CP Pistons has one of the largest ranges of forgings available in the industry, there are still times when a customer’s requirements may result in a piston that is not an ideal match to the forging used. As a result, some areas may be thicker than the specific application may require. As we all know, more weight means a slower acceleration curve and more strain on the other internal components. The CP Piston MIL process allows for the removal that unnecessary material, freeing up that horsepower and reducing the load on the other components in your engine. MIL is CP Pistons’ proprietary technology that creates a very lightweight piston, cutting away the excess material along the inside of a piston to match the contour of the external features. CP Piston engineers use their knowledge of piston design, their in-house computer modeling software which can utilize FEA, and the performance needs of each individual customer to decide precisely how much inner material can be removed without decreasing reliability. Each internal profile design is perfected then machined on four and five axis CNC mills. Quality and pride go hand-in-hand at CP-Carrillo -- if you’re looking for the absolute finest in quality this is it. Many builders -- ourselves included -- will not use anything other than Carrillo Rods for high performance applications. 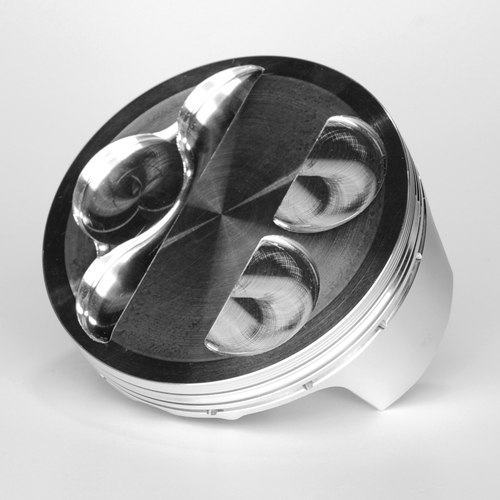 Search here for a wide range of CP Pistons for offroad and road powersports applications, too!